Get a 360 degree view of your data center. CA Data Center Infrastructure Management (CA DCIM) provides real-time monitoring of power distribution and use across your data centers, enabling you to measure, trend, alert and take action. It can also help you visualize and manage space and capacity, so that you can better plan and optimize your data center operations. With CA DCIM, you can prevent downtime with continuous monitoring, intelligent alerting and visibility into your data center and IT infrastructure. CA DCIM can be deployed rapidly, easily and efficiently so you can quickly respond to business needs. And for service providers, CA DCIM helps optimize your infrastructure to more efficiently support tenants and can help you differentiate and increase revenue with new services. Calculate how power is being consumed to help increase efficiency. Visualize your data center’s thermal environment in real time with either 2D or 3D heat maps. Calculation engine: With built-in formulas and calculations. Create elements that can calculate and store any user-defined variable data with every poll. Live reporting, trends and chargeback reports. Advanced alerting: Provides alerting and control functionalities for data center monitoring and facilities devices via energy monitoring system (EMS) or building management system (BMS). 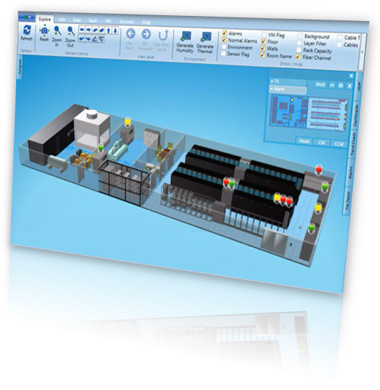 Extensive integrations: With BMS and IT data center management software applications. Control: Actuation of control for both physical and virtual environments. Capacity planning: Future capacity planning with what-if capabilities.